As skipper of the boat it is rare that I take shore leave and only tend to do so when we are safely secure in port. Such an occasion occurred on Tuesday, so I departed for Kent leaving the crew on board. Whilst away the crew got busy. I was the proud owner of eight shirts, but now I only have four. 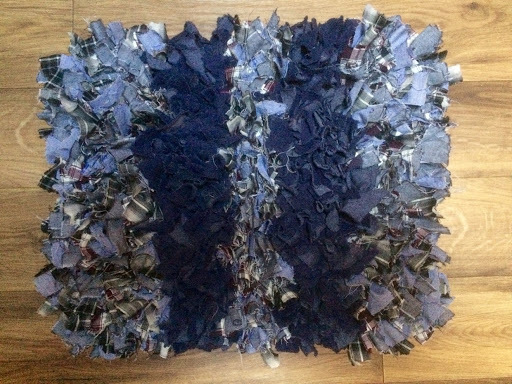 I do have a nice rag rug which seems to resemble the colour of my now missing shirts. Having departed Glascote Basin, we put on a bit of a spurt to get back to Yelvertoft before the arrival of some bad weather. We ended up doing in four days what we would normally do in fourteen. 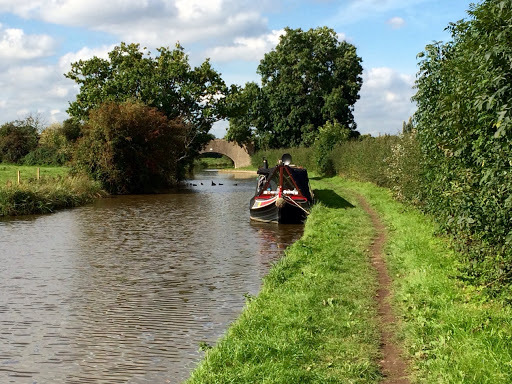 On Wednesday 12/10, we set off early to fill with water at the foot of the Atherstone flight. The flight consists of eleven single locks, and today luck was on our side. At each of the first five locks we met a boat coming down so the lock was set for us. The next three locks, we had a little assistance from the volunteers, and then again at the top lock. Soon we were passing through Nuneaton. This town has a bad reputation for rubbish in the canal. We passed through earlier in the year and we were pleasantly surprised, it seemed as if the town had cleaned up its act. Not so, it was once again squalid. 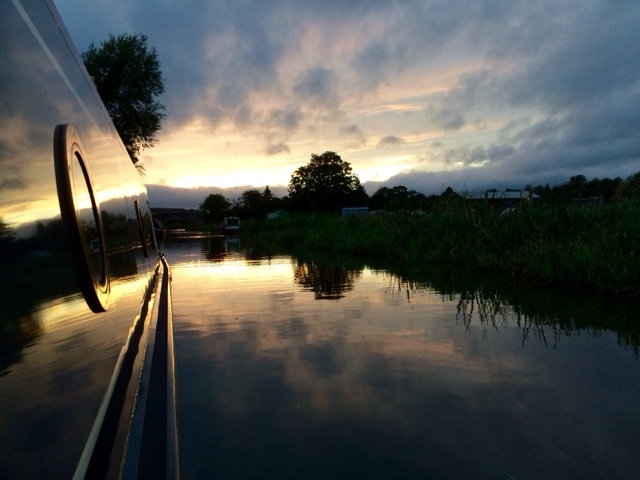 We passed the junction with the Ashby Canal, we are planning on doing this next year, following the Hudson boat owners gathering at Glascote in July. We turned left at Hawkesbury Junction in front of the Greyhound P.H. and picked up a mooring just beyond the stop lock. We were now on the Oxford Canal. Following our epic day, it was justifiable to reward ourselves with an evening meal in the pub. 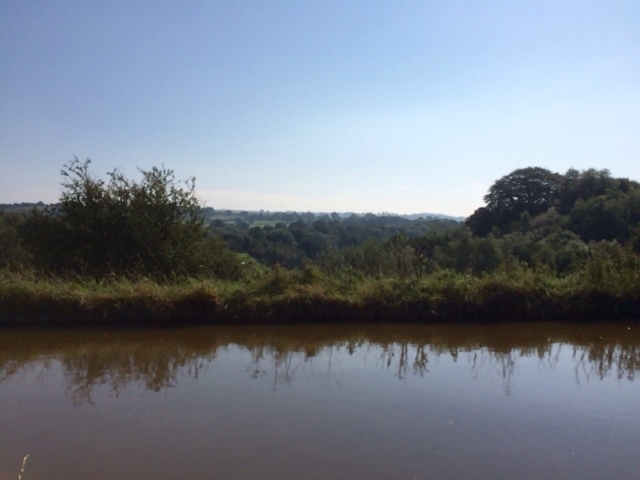 Thursday 13/10, we travelled 18 miles to the outskirts of Braunston. The weather was a bit warmer, the wind coming from the south rather than the east. This change whilst welcome, was also the reason why we wanted to get home before Sunday, when some heavy rain was due. 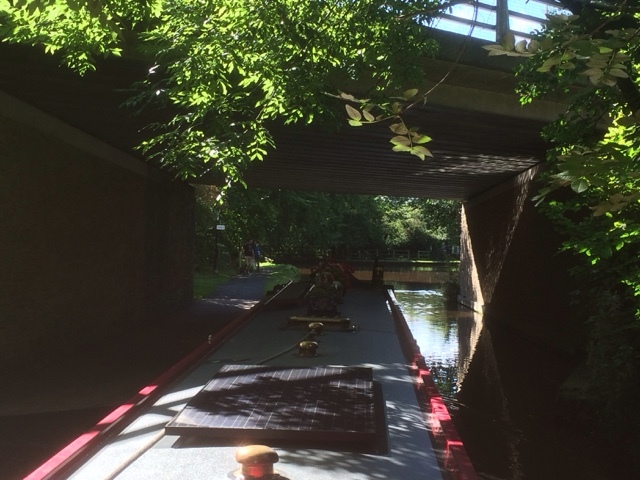 We saw very few boats moving today, and just after navigating the relatively short Newbold Tunnel we stopped for lunch. The afternoon session took us through the three locks at Hillmorton, then passed the new Marina under construction at Dunchurch. By the time we arrived on the outskirts of Braunston we were both ready for a rest. No pub this time as we had stopped in the middle of the countryside. 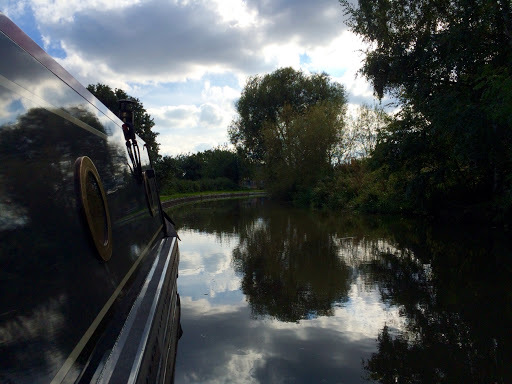 Friday 14/10, we made our way towards Braunston. At the junction we joined the Grand Union Canal heading towards six wide locks. Just as we were entering the bottom lock another boat arrived, which would make the ascent of the flight much easier. We navigated Braunston Tunnel without meeting any oncoming boats, and then it was a short cruise to Norton Junction. Here we turned left onto the Leicester section of the Grand Union. We moored in our usual spot, and after securing the boat walked the short distance to the New Inn for lunch. We also booked in for our Sunday roast. Saturday 15/10, the final leg of our journey. On arrival the foot of Watford staircase locks we were second in the queue. Shortly after our arrival, the single boat descending emerged from the bottom lock, and we were on our way. 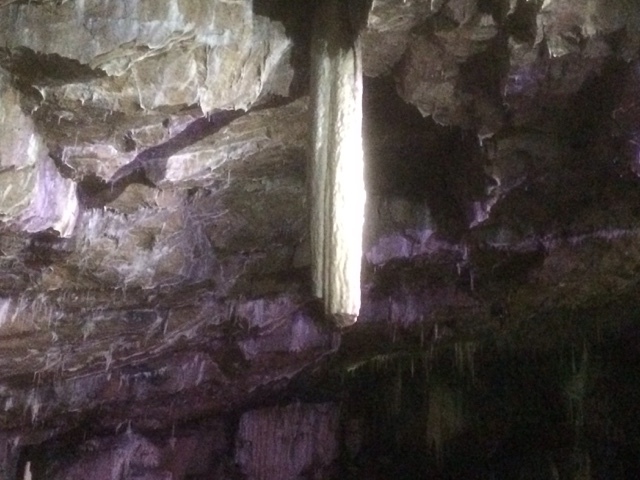 Once on the summit level of the Leicester line we navigated through Crick Tunnel, receiving a good drenching on the way through. As Cracks Hill came into view, the crew took four legs off the boat and walked him over the top, whilst I took the boat the long way round. They were waiting a good ten minutes for me to arrive at the other side of the hill. Back on the boat, we turned into the Marina and onto the service dock for a pump out and diesel. Now safely secured on our berth we have a few trips home over the next few weeks. Any further cruising will be restricted to the summit level and subject to the weather. Today the crew rejoin the boat, and shortly after lunch with our business at Glascote Basin complete, we made our way towards the cut. Under the bridge turning left towards Coventry the sun was shining, but there is the distinct feel of autumn in the air. After a few miles we reached the village of Polesworth and our chosen mooring spot was not much further. We opted for a short easy day today in preparation of the 11 locks at Atherstone we will face tomorrow. Whilst at Glascote with the benefit of being able to moor against the side of the dock, bother sides of the boat have received there biannual wash and wax. The solid fuel stove was also lit to burn off any stove polish residue in readiness for its winter usage. We are aiming for Yelvertoft on Sunday so a couple of long days (for us) are on the cards. Today we travelled four miles passing through the countryside between Lichfield and Tamworth, before arriving at the foot of Glascote Locks. 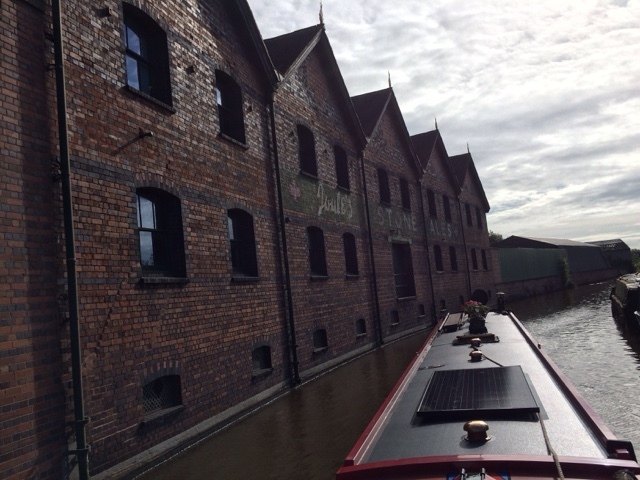 We had filled the water tank at Fazeley Junction, and had short wait whilst two boats ascended the locks ahead of us. Once through the top lock it was a sharp left turn into the basin. Almost as soon as we had secured the boat to the side of the dock, Neil and Clive appeared and promptly removed our old oven and installed the new one. We are staying here until Tuesday as the crew are having a long weekend away. I will use the time wisely, relaxing. Only a short hop of three miles today. The remains of the early morning mist were soon burnt off by the sun and just after breakfast we were underway. We met one or two boats on the way, mainly in the narrow or shallow sections. 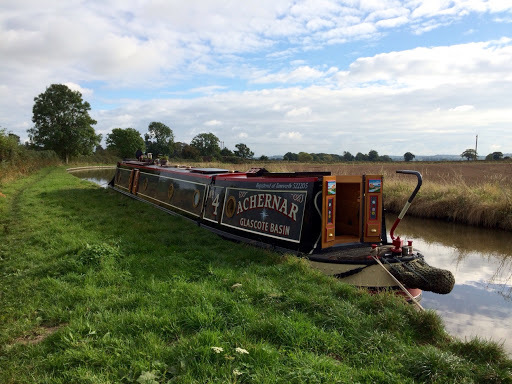 Just as we were approaching the Whittington Military Range we spotted a familiar boat, nb Telemachus moored. A quick blast on the klaxon resulted in a wave from the crew on board as we passed by. The visitor mooring at Hopwas was empty so we picked our spot and secured the boat. The furry crew member was then left on board whilst we visited the Tame Otter P.H. for lunch. Just one night will be spent here before we attended our boat's home port of Glascote Basin tomorrow. We only stayed one night by the pig farm, so on Thursday 29/9 we set off for Fradley Junction. We had a brief stopover in Rugeley, to stock up on supplies at the large Tesco store by the canal. Then it was on through Armitage, the town made famous for its toilets. The weather was fine for the time of the year, and there was very little traffic. On arrival at Wood End lock we encountered a hold up. The lock has a defective ground paddle, and is very slow to fill. Today it was made worse by a huge island of reeds that had been sucked into the gate paddle reducing the flow further. Each fill was taking nearly half an hour. Once we got through it was only a short hop to Fradley. We dropped down a further two locks and then made our turn onto the Coventry Canal. Once through the swing bridge, we had our pick of position on the visitor mooring as it was empty. It didn't stay that way for long. On Friday 30/9 we walked to the canal village of Alrewas, about two and a half miles away down the Trent and Mersey. We can actually return to Yelvertoft that way, but it involves a couple of river sections for which we would need an anchor, and this time we are stopping at Glascote Basin for a few days to have some work done. On Saturday 1/10, the weather was forecast to rain later in the afternoon, so having stayed our allotted 48 hours at Fradley we moved on. We were aiming for Huddlesford. We needed a pump out and diesel so planned to visit Streethay Wharf on route. Not long after tying up it became apparent the pump out machine was kaput. We continued on to Kings Orchard Marina, and fortunately, unlike our last visit it was not too windy. The forecast rain however had arrived early and as we exited the Marina the heavens opened. 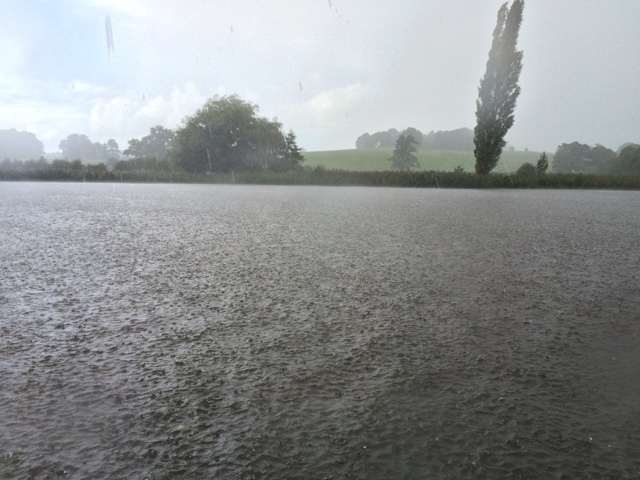 Quickly mooring just outside the entrance, we avoided the worst but we're still soaked by the time we finished. On Sunday 2/10 we walked in glorious sunshine to Huddlesford Junction where we found the Plough Inn. We have eaten here before and the food is great, today would be our first Sunday roast there. The pub is dog friendly, but four legs had been left behind to guard the boat. Today we moved just one mile to the spot we had intended to reach on Saturday. The weather is again glorious for the season, but we have noticed that in the mornings the boat is colder now. We have yet to light the solid fuel stove but the diesel heating is getting some regular use. We are only staying here one night as the cuisine at the Tame Otter, Hopwas is beckoning. After lunch we walked into Whittington to visit the local shop. One final point is that google have stopped supporting the app for iPad using blogger. This is a new app so I have no idea how it will appear once posted. 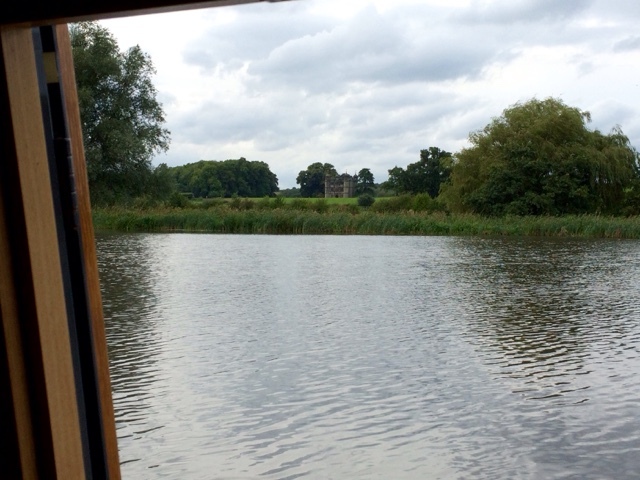 This morning we departed Tixall Wide having spent a few wet and wild days there. Over the weekend period, the wide had been very busy accommodating Stafford Boat Club during their regatta. We enjoyed watching the boat manoeuvring skills competition, well until the rain started, then we went inside, battened down the hatches and left them to it. 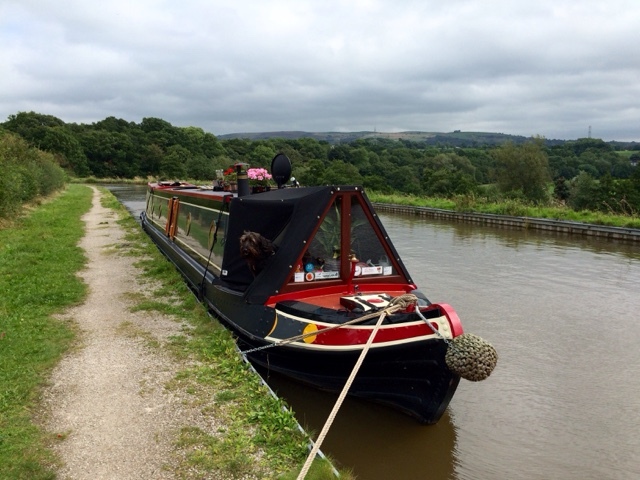 We got straight onto the water point at Great Haywood Junction and topped up the tank. Whilst waiting, we chatted with the crew of nb Maple Knot who informed us of a food festival in Stone next week. Wrong way for us, but we will chalk it up for another time. We had two locks to navigate and our timing at each was impeccable. On arrival at the pig farm we found our usual spot vacant. After securing the boat, the two legged crew gave four legs a brush. He had not been done for a while and was a bit knotted, so he was somewhat resistant to the process. There was only going to be one winner, and it wasn't him. Tomorrow we head for Fradley after a necessary stop at Tesco in Rugeley. Following our epic journey yesterday, today we opted for a relatively short four miles and two locks. Our arrival at Weston Lock was timed to perfection, a boat was just emerging as we round the corner and so we were straight in. At Hoo Mill Lock we had a short wait, and then it was only a half mile or so to Great Haywood Junction. We needed to top up the water tank, as we plan to stay put for a few days. The water point was busy, and when we eventually got on it, the tap was quite slow. The junction is where the Staffordshire and Worcestershire Canal departs from the Trent and Mersey. 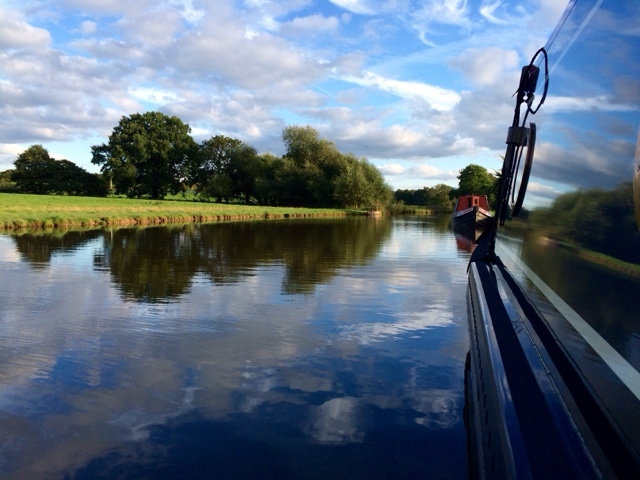 Our journey home takes us straight on, but today we turned right and headed a short distance to Tixall Wide. The canal here is wide enough to cruise in circles, so we can turn the boat and rejoin the Trent and Mersey next week. View from the side hatch across the wide. During the course of our summer cruise we have collected a few scratches to the blacking on the hull sides. 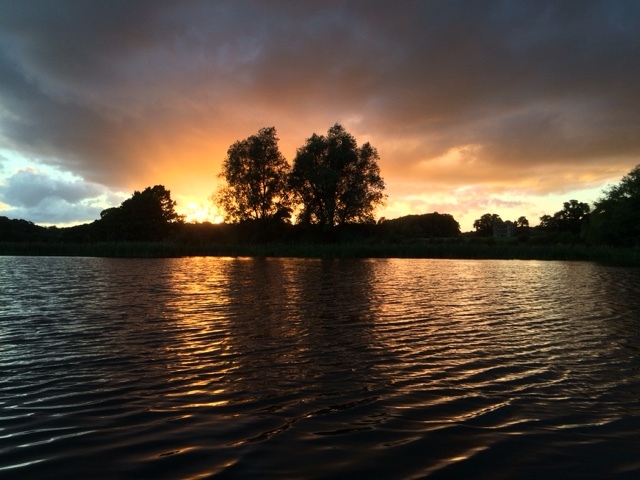 A further benefit of the mooring here at Tixall is a low bank, so whilst here, if the weather is fine we may tidy up the scrapes. Today we had a marathon day, for us anyway. We set off from Barlaston at 8.30 am, the sun was shining, but there is a definite autumnal feel in the air. We passed through the four locks at Meaford, meeting a couple of boats coming the other way, and soon we were entering Stone, the birthplace of the Trent and Mersey Canal. At this stage we were blissfully unaware of the drama that was soon to occur. Former waterside warehouses in Stone. Shortly after passing the above warehouses, we picked up a small grp (plastic) boat ahead of us. This was going to slow our progress through the remaining locks. Sometimes with these small boats, two boats can descend in the lock together, but our 60' and their 15' meant our combined length was too long for the locks. At the final lock in the flight, the plastic boat caught up with a shorter narrowboat and followed it into the lock. All was fine and once the top gate was closed, other boat crews began to open the paddles draining the lock. It was at this point the lady from the plastic boat climbed back onboard. The boat tipped and moved away from the edge of the lock, depositing said lady in the water. Fortunately the paddle operators saw what had occurred and immediately dropped them stopping anymore water leaving the lock. At the same time, three or four of us onlookers grabbed the lady before she disappeared under either of the boats. It took all four of us to haul her out, even though the water level had only dropped by about a foot. After all the excitement we pushed on, navigating a further two locks at Aston and Sandon, before arriving at our intended mooring spot just beyond the village of Salt. Our primary reason for choosing this location, was the good reports we had received about the Holly Bush Inn. 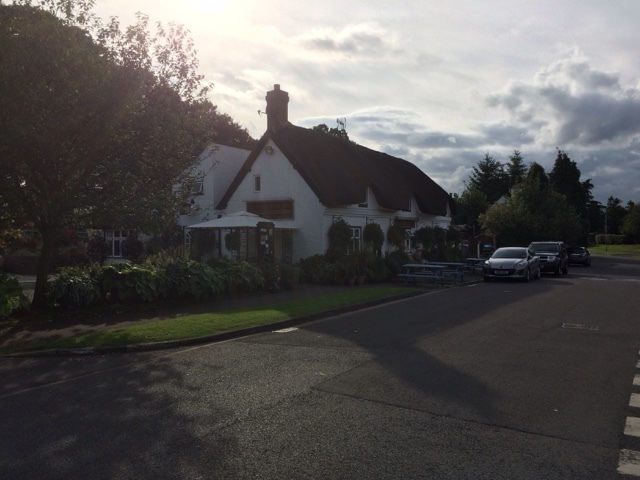 It is a 16th century thatched inn and is reported to be the oldest in Staffordshire. After securing the boat we walked to the pub and were not disappointed by the choice on the menu. The food lived upto expectations. 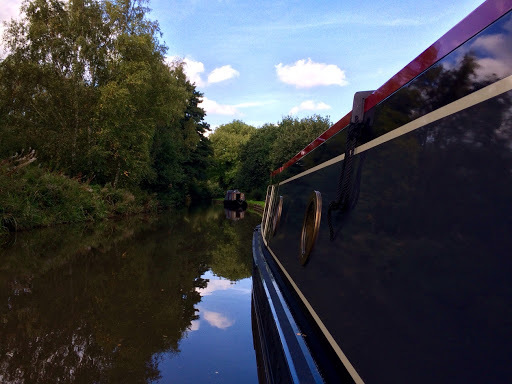 Yesterday we set off from our mooring at Westport Lake for our trip through the potteries, aka Stoke on Trent. We had six locks to navigate on the eight mile journey, including the three at Etruria. The trip was fairly uneventful, meeting only a few boats on route. The amount of canal traffic seems to have reduced dramatically over the last week or so. We moored just beyond the Wedgwood factory, and after securing the boat we walked to The Plume of Feathers P.H. for lunch. Today we visited the Wedgwood factory for a tour of the site and museum. 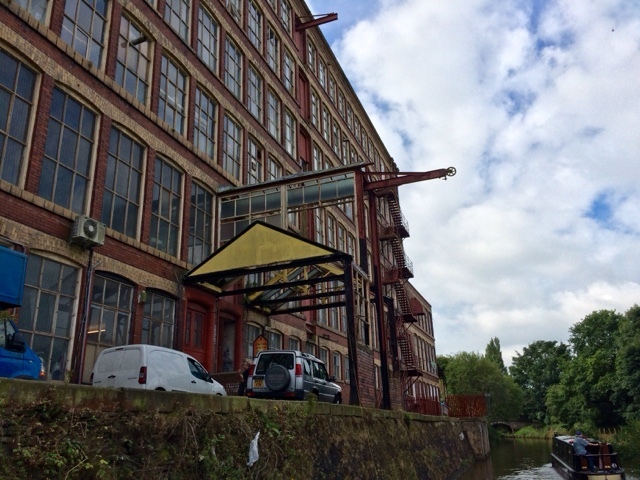 The factory had moved from its original location at Etruria, to Barlaston due to mining subsidence. 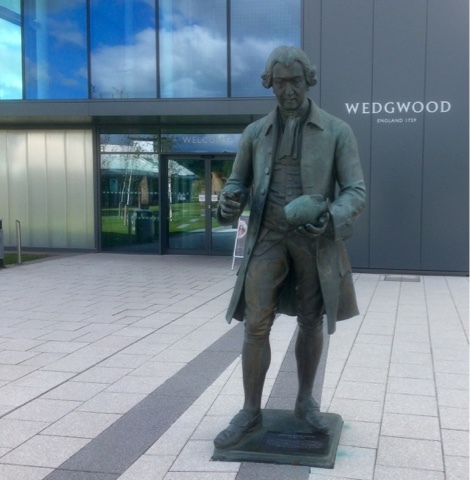 Many of the original methods used by Josiah Wedgwood, remain in use today. Some of the machinery however has been updated. The modern kilns for example take just over nine hours to fire the pots, whereas the old bottle kilns used to take up to 48 hours to achieve the same result. The tour was very informative, not least the fact that there are only two hand painters working at the site. A hand painted tea service has to be pre ordered and will set you back circa 30 K. After the tour lunch was taken in the Wedgwood dining hall, but not using Wedgwood hand painted bone china. We set the alarm for this morning, a very early 8 am. Within 20 minutes of getting up we were underway, hoping we would not have a queue at the water point, by Hall Green stop lock. We were in luck, it was free, so we commenced filling our empty water tank and had breakfast while waiting. A number of boats passed us heading north, and approx. 40 minutes later we set off for the end of the Macclesfield Canal. At Hardings Wood Junction we turned right onto the Trent and Mersey, and headed the half mile or so to the northern portal of Harecastle Tunnel. Having travelled through here only a few weeks ago, we had cleared the roof of items that were too high, and were prepared at the back of the boat for the CRT horn and headlight check. There were two boats in the queue ahead of us, and a further two arrived shortly after. Boats were still heading north in the tunnel, so we had a short wait until they emerged. There is a bit of a turn as you exit, and a Black Prince hire boat did not make a very good job of it, striking the bank quite hard. Unfortunately for the steerer there was a large audience, which is usual when things go wrong. Once the second boat cleared the tunnel we were on our way. 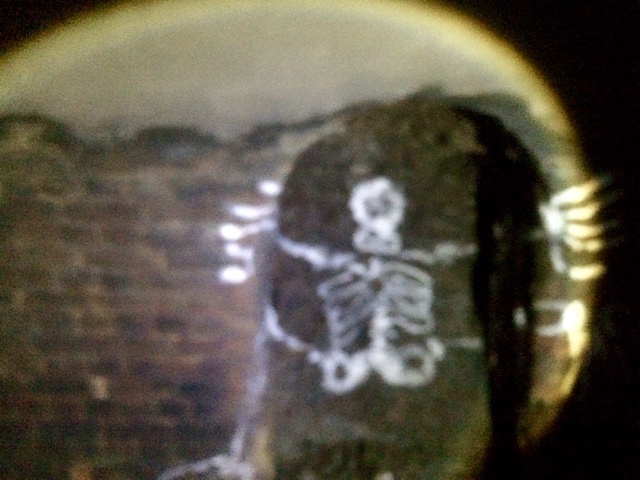 We had one objective in addition to the transit, and that was photograph the tunnel skeleton in his alcove. Not the best photo in the world, but not bad in the pitch black, whilst moving, using an iPhone. For anyone reading this wanting to know where he lurks, travelling south he is 450 yards in on the port (left) side. After emerging into the daylight at the southern end, it was just a short hop to our intended spot at Westport Lake. We will only spend one night here, then tomorrow head for Barlaston. Having spent the past few days in Congleton, today we moved on. 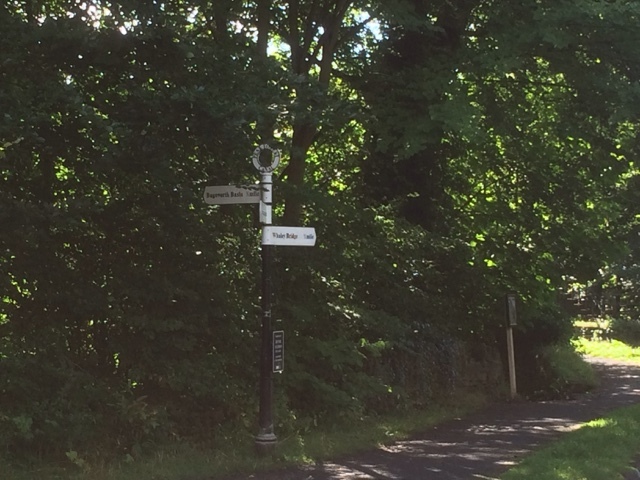 During our stay we have enjoyed several walks around the area, including a walk along the Biddulph Valley Way. 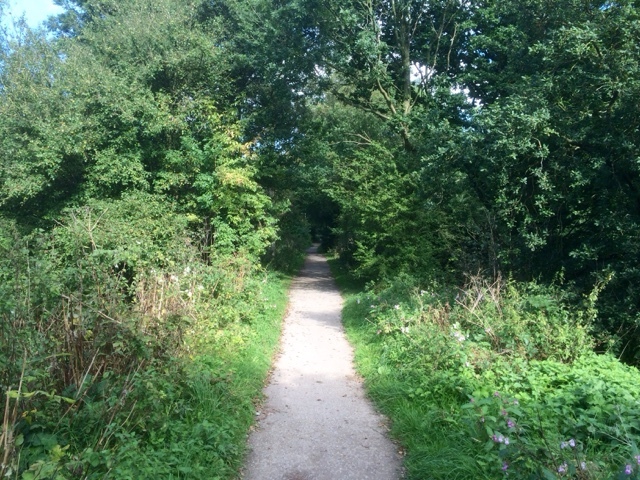 This was a former railway used to carry freight between Biddulph and Congleton. 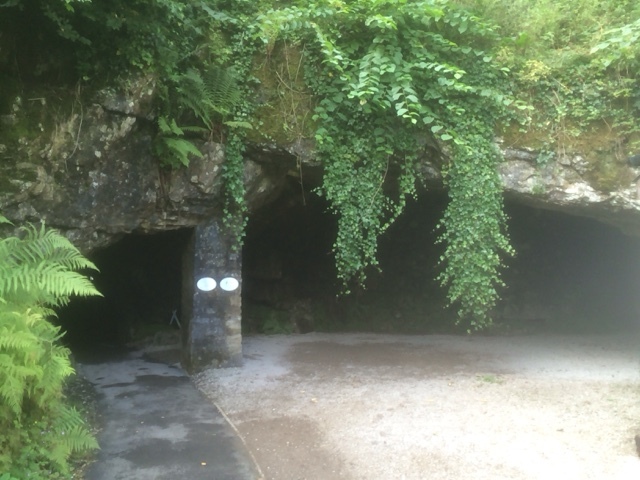 It was dismantled c 1927, and now forms a scenic walk along the side of the valley between the two towns. 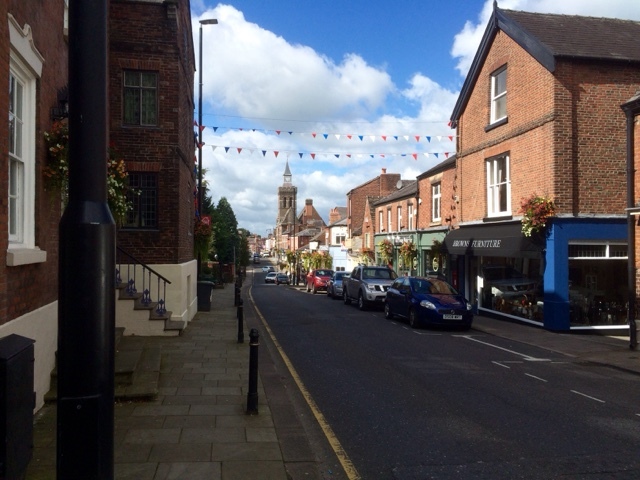 We also visited Congleton town centre with its impressive range of shops, and even more imposing town hall. We had lunch at a small Italian deli, and in the warm sunshine it had a Mediterranean feel to it. Sunday lunch had been taken at the Railway Inn close to the canal. We have eaten there a couple of times and the food was exceptional. They are also dog friendly, but this time four legs stayed on the boat. We allowed the overnight rain to clear before setting off for Scholar Green shortly after breakfast. Just prior to our intended mooring spot we stopped at Heritage Narrowboats hirebase for services. After securing the boat and having lunch, we walked across the fields towards the hamlet of Moreton. We had several hundred cow pats to negotiate on our way, the furry crew member's nose seemed to find most of them. 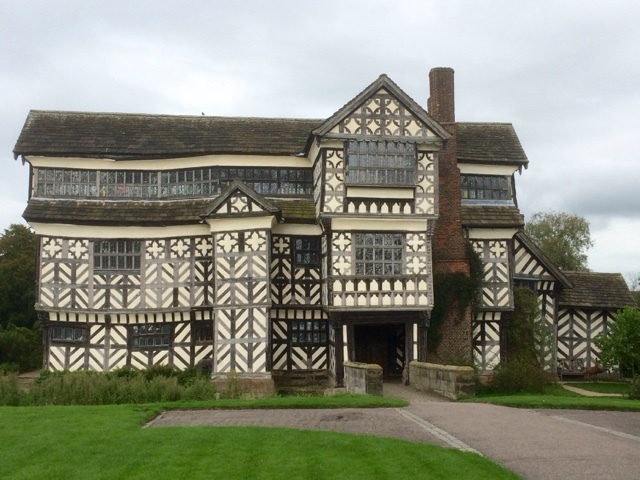 The reason for our cross country trudge was to visit Little Moreton Hall. 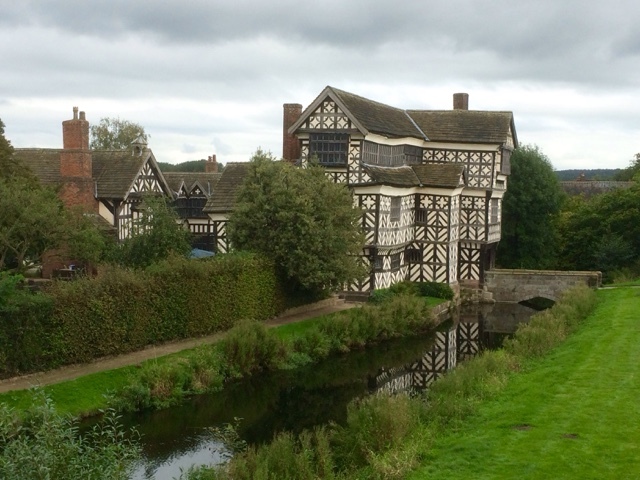 This is a 15th century half timbered house with moat, and given its top heavy construction it's a wonder it is still standing after 500 years. 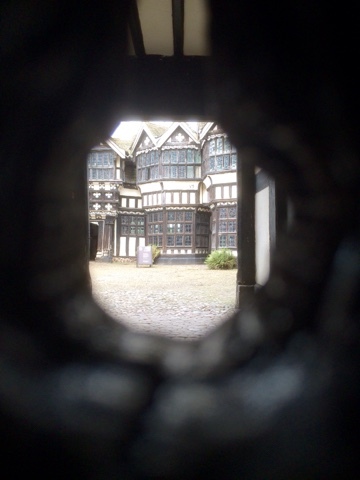 The property was unfortunately closed to the public today, but beyond the huge wooden front door, peering through the keyhole, we could see a glimpse of the courtyard within. 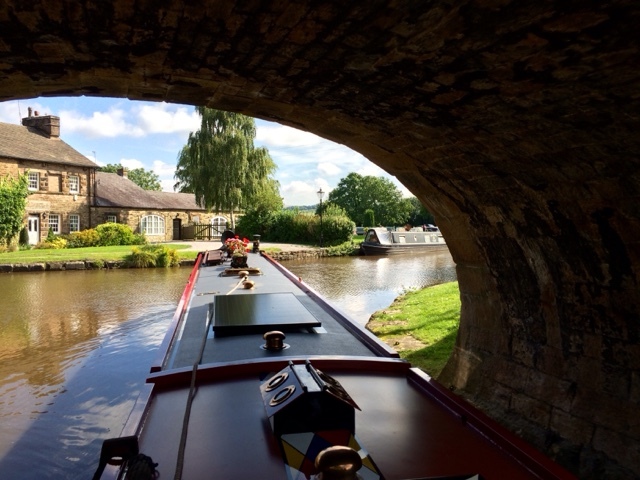 We are now located less than two miles from the end of the Macclesfield Canal, and nicely positioned for our turn onto the Trent and Mersey canal and transit of Harecastle Tunnel tomorrow. Well, yesterday evening we had the mother of all thunderstorms. The rain was coming down like rods and the forked lightning was striking something, further along the valley. It was great watching, safely tucked up inside the boat, peering out from the portholes. The centre of the storm did not pass directly overhead so we were spared the worst, and after a couple of hours it was all over as it moved northwards. It certainly cleared the air, as this morning we woke to bright sunshine and blue skies. Just as we were preparing the boat to move the Canal and River Trust boat logger, logged us at Bosley. We saw him again as we were cruising on the approach to Buglawton, and again at the water point the other side of the village. On this occasion we did ask if we only went in his book once, and not the three times he had seen us. 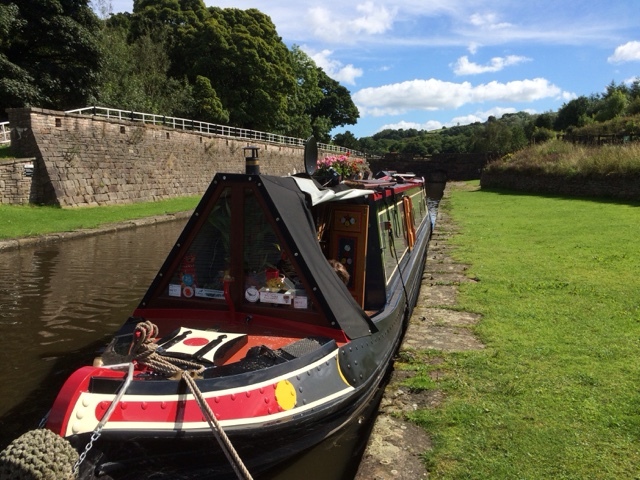 After topping up the water tank, we cruised the final mile to the Aquaduct at Congleton. Unusually the mooring here appears to be up to 14 days, rather than the normal 48 hrs we have encountered elsewhere. 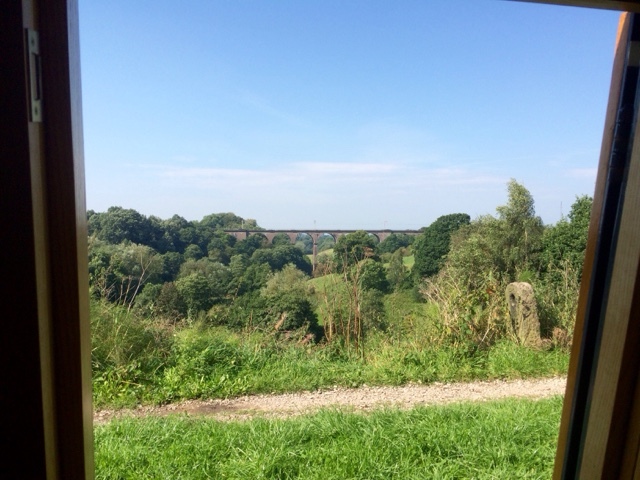 View from the sidehatch, down the valley to the viaduct. The views from the other sidehatch. We had planned to stay only one day here, but given the setting, and the fact that the centre of Congleton, a small market town is only one mile away, we will probably stay here till the weekend. Lunch was taken today at the Queens Head P.H. which is canal side in the town and they are dog friendly. Yesterday we spent our final day at Lyme Green, walking back to Sutton Hall at Gurnett, for a Sunday roast. Today, having decided on an early start we were underway by 8 am. We needed water, and the next water point was located at the top of the Bosley Lock flight. Our tank was near empty, which could mean, depending on the speed of the tap, up to an hour to fill. We negotiated the ridiculously stiff swing bridge at Broadhurst, and then settled into a blustery three mile cruise. We passed the base of the Four Counties fuel boats, as coal boat Halsal was being loaded for its next trip. On arrival at the locks, the water point was empty so we commenced filling the tank. The volunteer lock keepers made an appearance asking if we needed help down the flight. Just as we were finishing two boats arrived and joined the queue behind us, as another boat ascended through the top lock. Perfect timing for us. We worked our way down the flight meeting several boats on the way up, and arrived at our intended mooring spot on the visitor mooring just prior to the Dane Aquaduct. The mooring was empty but it would not stay that way for long, we do however have good views across the valley. We will stay here for a day and maybe explore a walk along the River Dane. 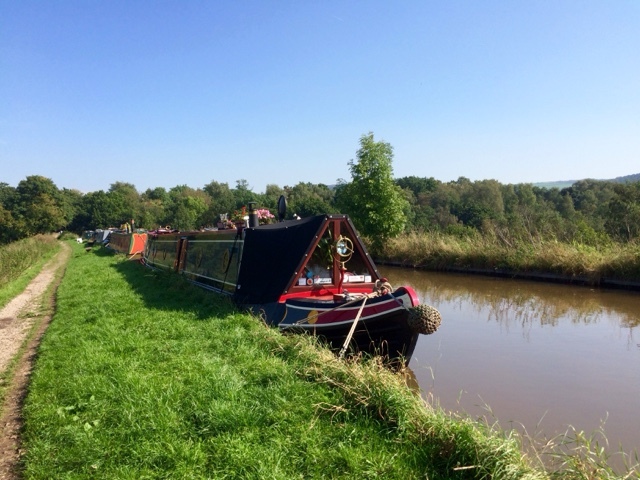 Mooring at the foot of Bosley Locks. Yesterday we moved on from our spot opposite Lyme View Marina. The morning started with rain, however, the forecast was that it would clear by lunchtime. Using the rain radar weather site, we could track the progress of the showers, and by eleven o'clock we were good to go. 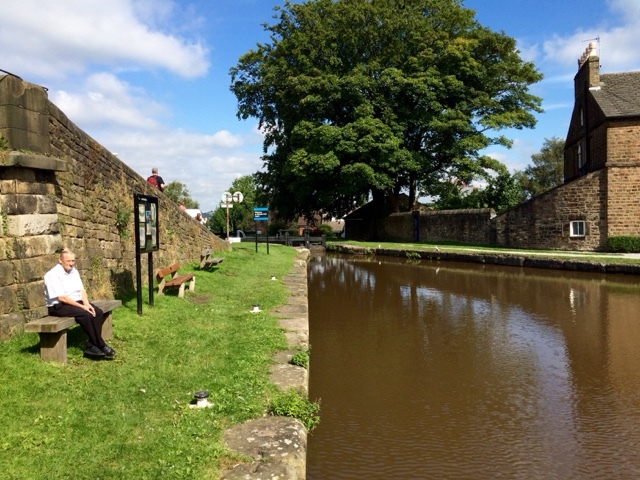 After two miles we were passing through Bollington, and the moorings by the Aquaduct were empty. Further on through Macclesfield we arrived at Gurnett, and again the moorings were nearly empty. This is so different to a few weeks ago when we travelled up this way. Clearly the holidays are over now and there is less boat traffic about. We arrived at Lyme Green which has the appearance of rural tranquility, but is remarkably close to a very useful retail park, pleasantly obscured from view. Mooring spot at Lyme Green. Today we walked back into Gurnett, and took lunch at Sutton Hall. 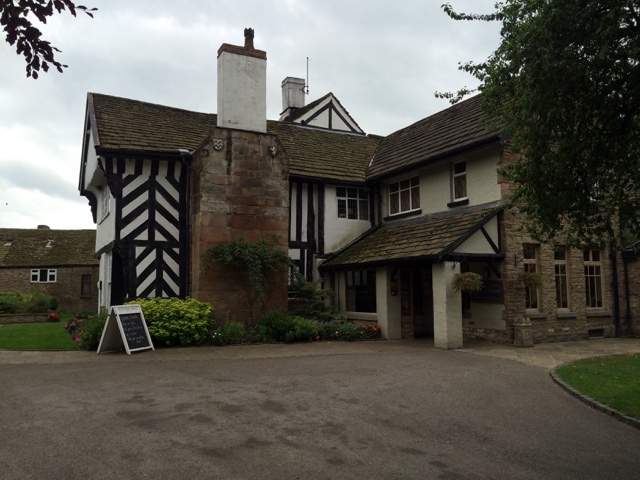 This is a former 17th century Manor House that has been converted into a restaurant/pub. It is also the one time family home of the Earls of Lucan. We kept our eyes open, but there was no sign of the missing Lord. 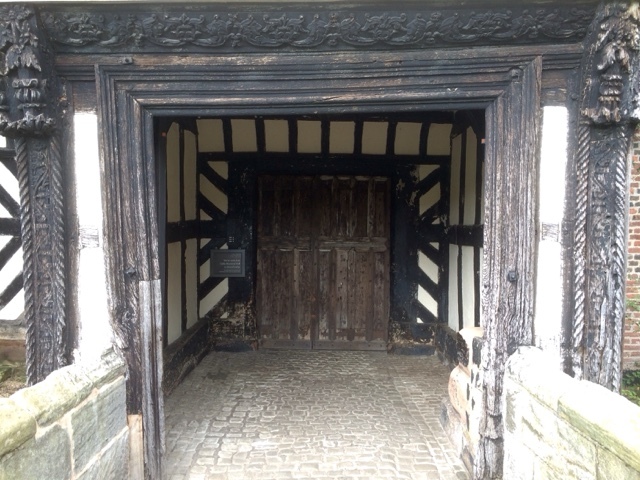 The building has an abundance of large oak beams and heavy oak panelled walls. 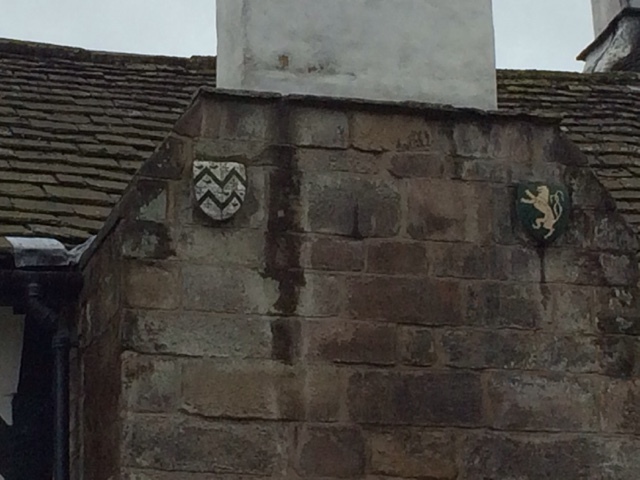 Previous occupants family crests mounted below the chimney. As we write this, the wind is howling outside and we are in for a fairly stormy night. Tomorrow however is forecast to fine and dry. We will stay here till Monday by which time we will be in need of water. 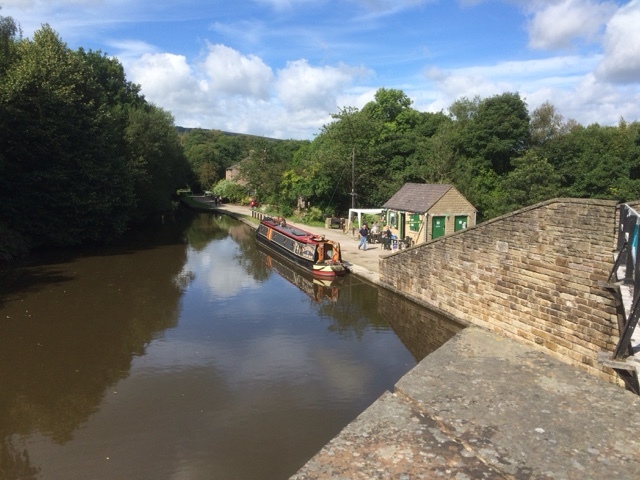 Today we departed New Mills Marina, after we topping up with diesel and pumping out the waste tank. We enjoyed our short stay there as it is only a small Marina, and the people we met were friendly. 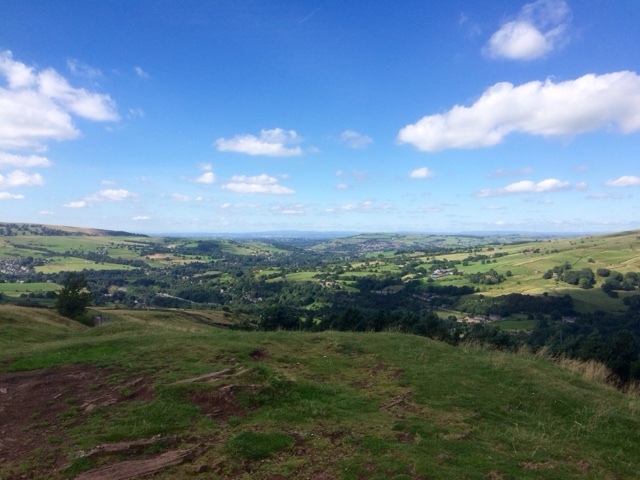 The views from the berths across the valley towards Kinder Scout were fantastic. At Marple Junction we made the turn back onto the Macclesfield Canal, and now just like the sun, we have commenced our journey south for the winter. Our intended mooring spot at Higher Poynton was unavailable, the last of the Braidbar boat stragglers, still there following their open day at the weekend. So we continued on to our secondary choice, opposite Lyme View Marina. This time we have stopped on the 24 hr moorings, which do not have an underwater shelf, unlike where we stopped previously here on the other side of the bridge. We have been unable to post any updates over the past week, due to a severe lack of phone signal and wifi at our chosen spot within Bugsworth Basin. 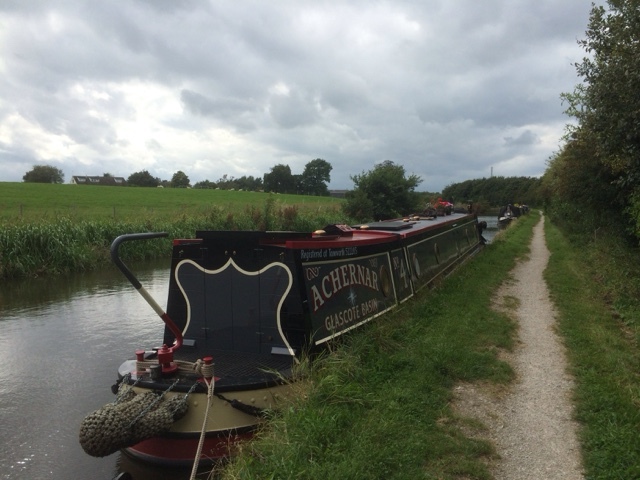 On Friday 26/8, we set off from Disley aiming for Bugsworth, at the end of the Peak Forest Canal just over three miles away. 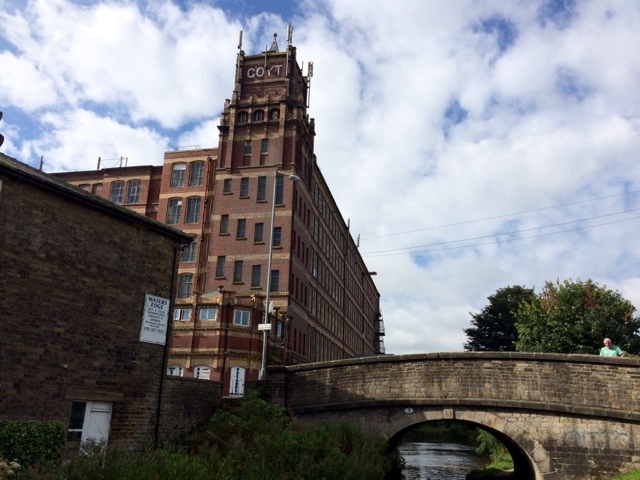 As we approached New Mills, the air began to smell strangely sweet. Passing a former mill building, the source of the smell became evident, as we noted the factory now bearing a sign stating it was the home of 'Swizzles', makers of drumstick lollies and other tasty treats. 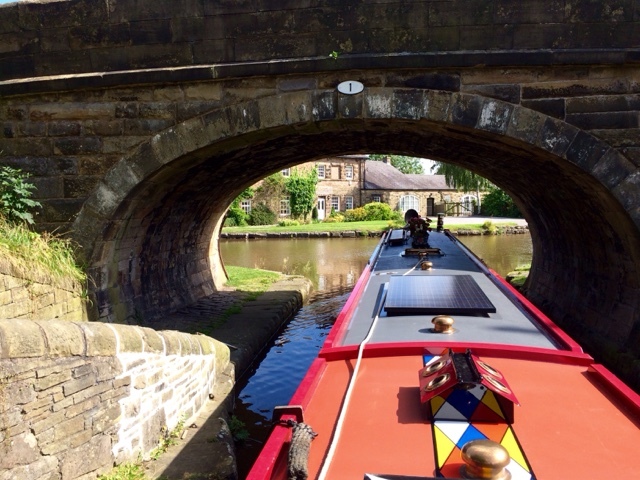 Next was New Mills Marina, a small attractive online Marina, which we have booked a few days in on our return journey, whilst the crew takes some shore leave. 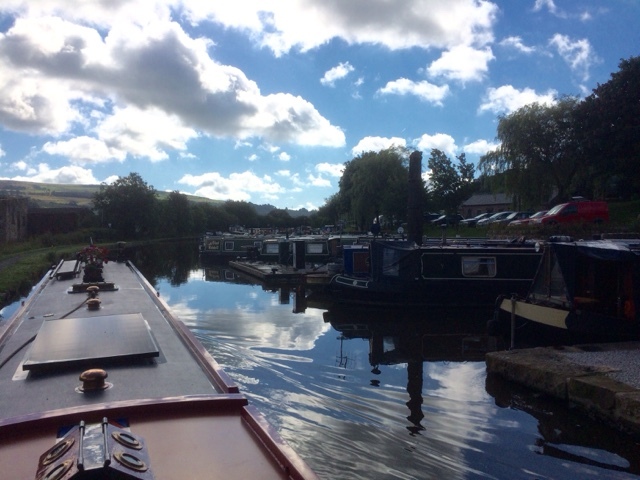 The Marina, in addition to having full services which we will need on our return, also has wonderful views across the valley to Kinder Scout, and the Peak District National Park. Kinder Scout is renowned for the mass trespass that took place in the 1930's, which led to the opening up of the countryside to the general public. 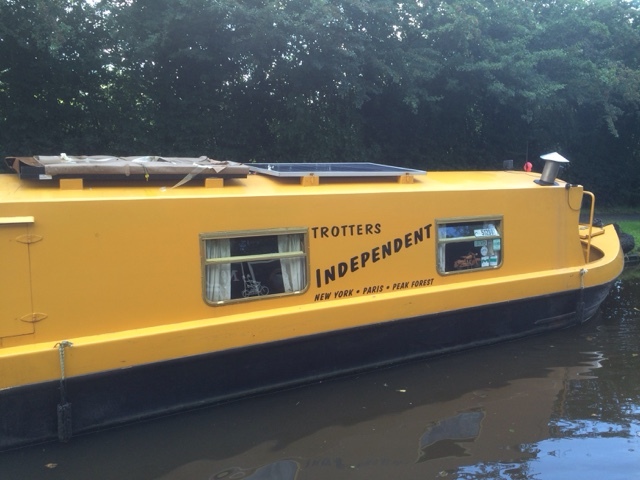 We also noted that the area is frequented by television royalty, in the shape of Delboy and Rodney, who we suspect are trying to open up a Peak District division of Trotters Independent Traders. Soon we were on the final approach to the junction at the end of the canal. 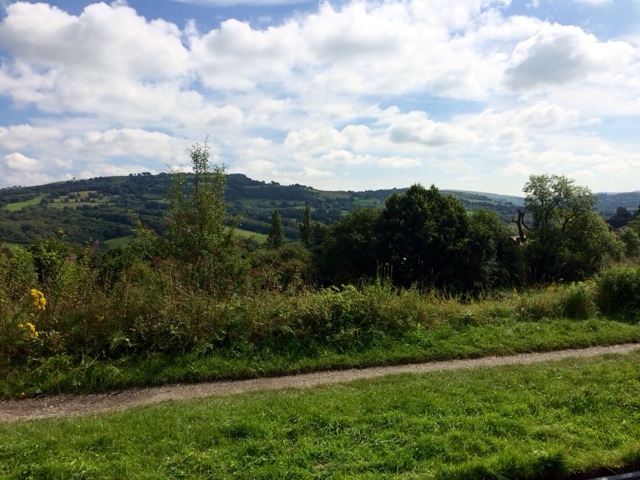 Left for Bugsworth Basin, and right for Whaley Bridge. Negotiating the junction towards Bugsworth Basin. 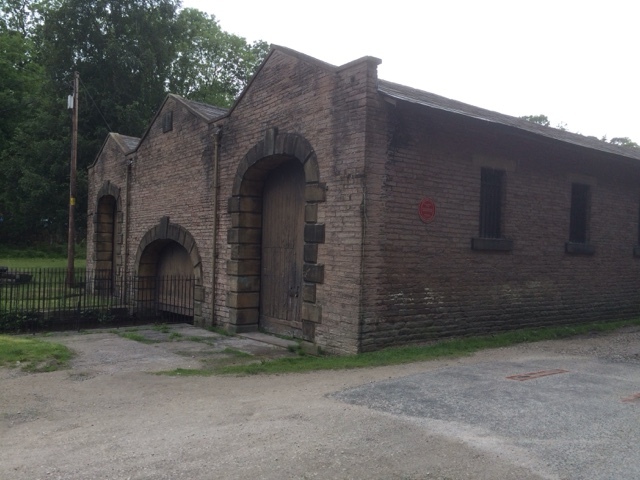 Bugsworth Basin consists of three separate basins, built in stone, which are looked after by the Bugsworth Basin Heritage Trust. At the entrance to the complex is the information centre and water point. Planning on being here a few days, we needed to top up with water, but another boat was on the point. We had also been advised by fellow bloggers from nb Melissa, whose blog is in our blog list, that the lower basin provided the best location to be away from the noise of the A6. With a bit of time to spare, we took the boat through the middle basin to the top basin by the Navigation P.H. and back down again, and onto the now empty water point. After filling with water we were positioned nicely to reverse into our spot, within the lower basin. We had a nice spot with lots of grass for the furry crew member to play on, and a good tv signal, but absolutely no phone or data signal. After securing the boat lunch was taken at the Navigation, which is dog friendly, and we also booked in for a Sunday roast. 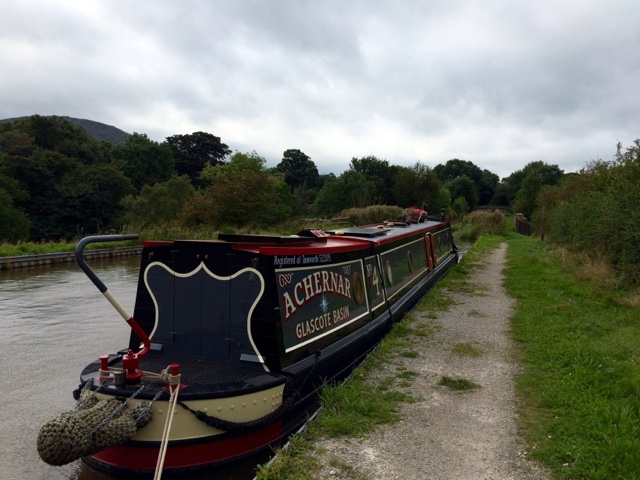 Saturday 27/8 was a wet day, we did however walk along the canal to the junction, and then into Whaley Bridge. This was to check out the nearby Tesco superstore, and the location of the railway station for later in the week. During our visit to Tesco we researched the possibility of a different SIM card for the phone but when the assistant stopped laughing, he said "nothing works round here". 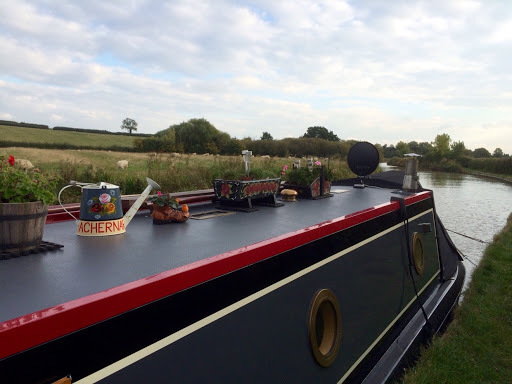 Sunday 28/8 consisted of lunch at the Navigation, and later in the afternoon as the weather began to brighten, we washed the boat, and polished some brass. Monday 29/8. The basin is surrounded by open countryside and peaks. 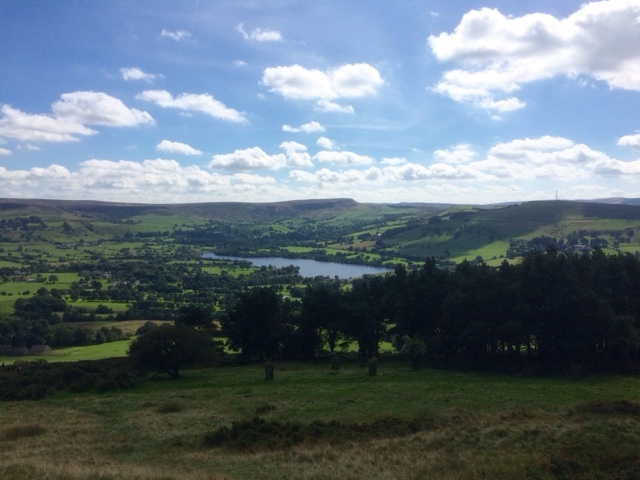 We had sourced a map of the local area, and had chosen a walk the the summit of 'Eccles Pike'. Whilst it felt like we had climbed a mountain, at 360 m above sea level it was in fact only a hill. The views however were spectacular. 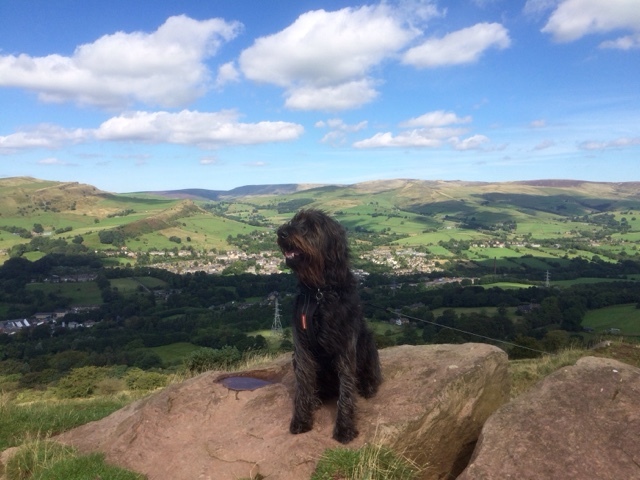 Oscar found himself a nice spot on the summit, complete with naturally formed drinking bowl and with the panoramic views of Kinder Scout in the background. Viewing towards Stockport and Manchester. Our route was circular, and soon we found ourselves back at the Navigation P.H. for refreshments. Being the last bank holiday of the summer, and with the fine weather, the place was heaving. 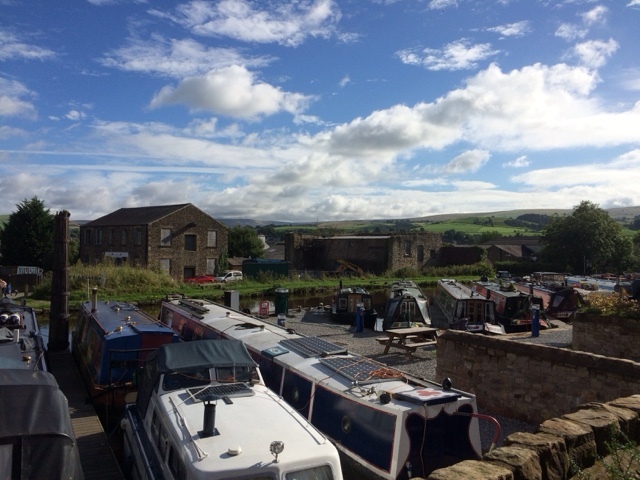 Tuesday 30/8, our walk took us along the canal towards Furness Vale, followed by an exploration of some very under used footpaths, across country below Cracken Edge before arriving back at Bugsworth Basin. 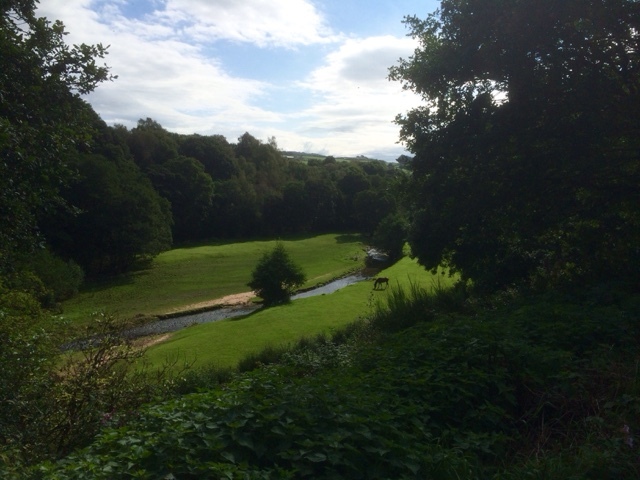 Wednesday 31/8, after walking into Whaley Bridge we caught the train to Buxton. 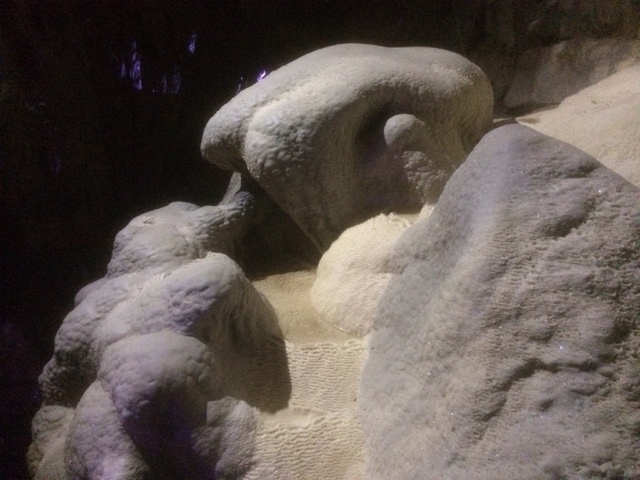 We walked through the Pavilion Gardens, on our way to Poole's Cavern. 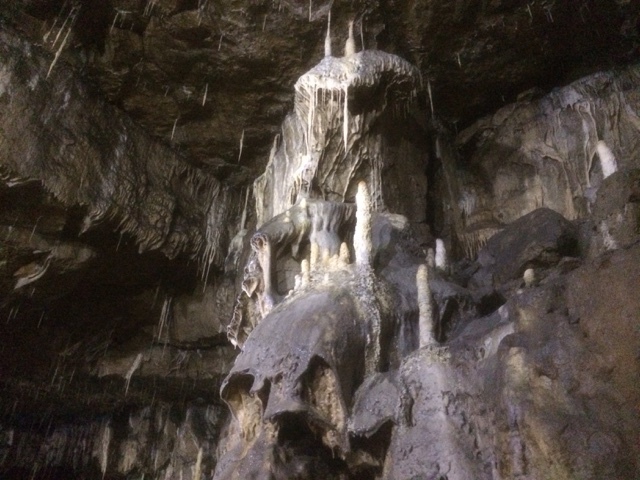 These are a series of caves which have been in human use since the Stone Age, but were opened up for the public during the Victorian era. Following our visit below ground, we walked back into town to view the famous Cresent and Spa Pumphouse. Unfortunately, both were clad in scaffolding currently undergoing restoration. Next was lunch at the 'Old Hall House' hotel, reportedly England's oldest hotel, before a walk through the town and back to the railway station for our return journey. 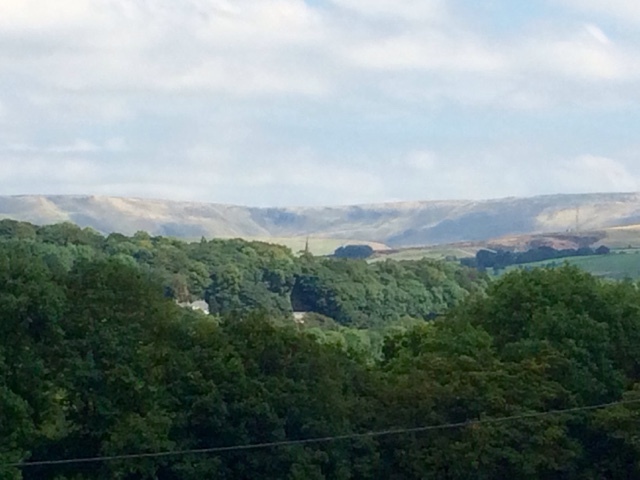 Today we set off after breakfast for New Mills, a mere two miles away. The weather was fine, and we arrived just before lunchtime. We are now safely secured on a pontoon berth, and will stay here till Tuesday next week, when the crew return from their weekend away. For our future reference, we now know that after spending the initial 48 hour limit within Bugsworth Basin, an application can be made for an extended stay permit up to a maximum two weeks. Next time we head this way, we will stay longer and maybe hire a car to explore further a field.